This album feels live; from the fevered flicking of strings to the conversational improvisation, it was a shock to realise half way through it is actually a subtly layered studio record featuring only Remi Harris on the guitars alongside the ever fabulous Mike Green on double bass - essentially a duo! Remi has been gaining more and more plaudits since I first met him at a festival I co-organised here in Nottingham in October 2014; most recently he has been selected by BBC Introducing, the PRS Foundation and Jamie Cullum to play at this year’s Montreal Jazz Festival! This hot, young guitar genius’ star is firmly in the ascendant. His second album, In on The 2, is a collection of tunes he has enjoyed exploring live, which all have a personal meaning to him. The disk begins with The Beatles (Can’t Buy Me Love), whom he credits as the reason he fell in love with music as a child. While his style focuses predominantly around Gypsy swing, as tracks progress, he dips deeper into rock and flamenco. His chosen repertoire sits on standard foundations (Round Midnight, Cherokee and others) but the sound is in no way vintage. There are some interesting but not overt substitutions to take well known tunes outside their well-worn box. 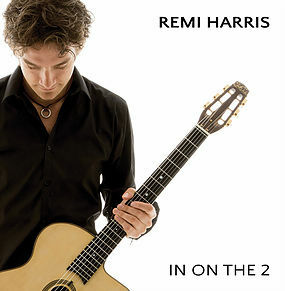 Remi’s up tempo, wall of sound, virtuosic playing is simply jaw-dropping for a man still in his 20s, especially in Have You Met Miss Jones (a tribute to Joe Pass, which sounds like a one-take, un-layered solo) and in Putting On The Ritz with its mind boggling scales and syncopation. I particularly love his version of Bill Evan’s Waltz for Debby, dedicated to his jazz-loving Grandad Bob Harris. It starts in an ethereal, loose folk style - almost disappearing from earshot and then dancing back, once in a swing groove the chromatic counter melodies chase up and down with zest while chops provide anchoring percussion. Sissy Strut seeps some funk into the Gypsy house, Odd Elegy by Dhafer Youssef wanders even further from the traditional into African grooves and time signatures and his rock heart spills over in Need Your Love So Bad by Fleetwood Mac. Remi showcases impeccably what he likes to play most, and it's serendipitous that it is exactly what today’s listeners want to hear.